Achilles tendon is the largest tendon in the body. The Achilles tendon forms from two muscles in the back of the calf, the gastrocnemius, and the soleus, about 15 cm to 6” above the ankle joint and spirals as it crosses the ankle joint to attach to the calcaneus., The tendon is covered by a sheath which allows easy movements of the ankle which is supplied by the posterior tibial artery. When the calf muscles contract, it causes the ankle to point the foot downward and the foot to turn inward and up. The most common initial symptom of Achilles tendon rupture is a pain and difficulty to place the foot down. The previous tendon irritation is one of the predisposing factors Achilles rupture. Immediately after an Achilles tendon rupture, walking becomes difficult, and one is unable to stand on their toes. Just above the insertion of the tendon in the heel, there is a relative lack of blood supply which may be associated with the location of the tendon rupture. The rupture is typically spontaneous and most commonly observed in individuals in between 20 and 45 years of age. Patients on corticosteroids, fluoroquinolone overuse are at risk factors for Achilles rupture. A sudden, forceful movement of the foot on the ground against resistance is the most common cause of Achilles rupture. Sometimes, the tendon does not fully rupture but only a partially tears. A partial tear can progress to a complete tear. 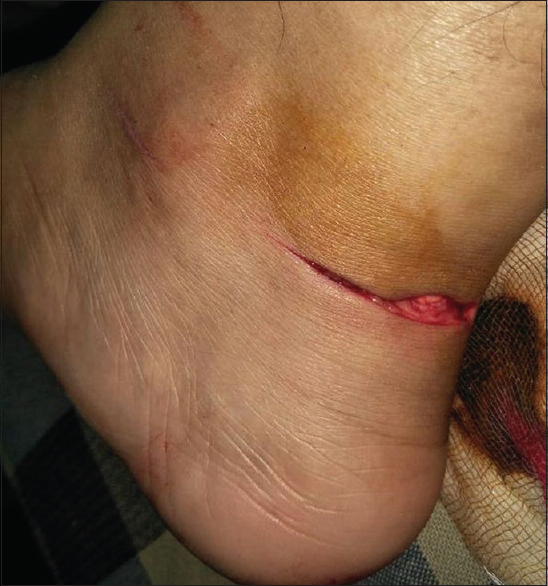 A 19-year-old female patient had sharp cut in the posterior aspect of ankle due to glass at home [Figure 1]. She was not able to bear weight after trauma. On local examination, there was a transverse laceration of about 5 cm just above the calcaneum posteriorly. The tendoachilles was exposed through the laceration and was found to be completely cut with clean edges. It was ruptured approximately around 2–6 cm proximal to the calcaneus tuberosity [Figure 2]. The repair was done within 48 h after the rupture. The rupture was clinically confirmed by Thompsons test and gap palpation test. Ultrasonography revealed a complete tendoachilles rupture 3 cm proximal to the calcaneus. Plain radiographs showed no abnormality in the bones. After taking written and informed consent, the patient was subjected to surgery. She was put in prone position. 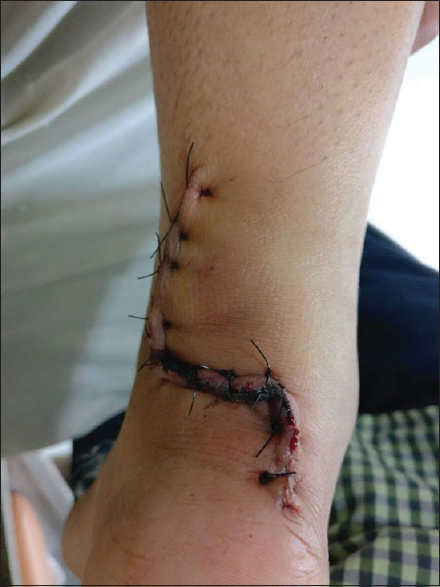 A Z-incision was made over the tendon rupture site incorporating the laceration [Figure 3]. Thorough debridement, irrigation of the wound, and coagulation of bleeding tissue were done. The tendon ends were freshened and approximated by Krackow suture technique using ethibond-5 suture [Figure 4]. 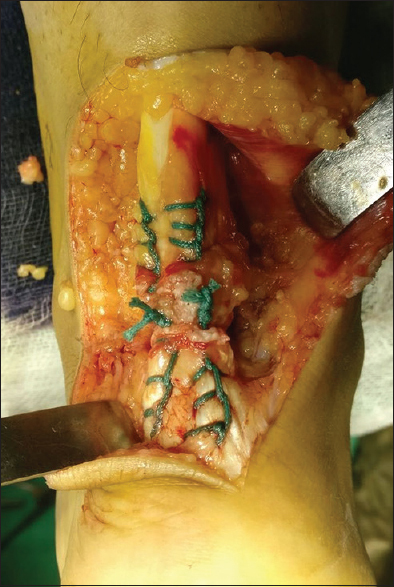 Both the ends of the core sutures were tied, and the repair was strengthened with a vicryl-1 suture [Figure 5]. Finally, the tendon sheath was repaired followed by skin closure. Above-knee plaster cast was applied in 40° plantar flexion of the ankle and 15° flexion of the knee, with a dressing window. This was continued for 1 month. The patient was advised for nonweight-bearing for 1 month. On the 1st month follow-up, ultrasonography was done which showed healing of the tendon. The plaster cast was removed, and another below-knee walking plaster cast was applied with the ankle in neutral position for 1 month. After 1 month, she was advised for partial weight-bearing with walker and ankle range of movement exercises followed by full-weight-bearing after 2 weeks. At 3-month follow-up, the patient is walking full-weight-bearing without support with full range of ankle movements and no complications. The incidence of complications following surgical treatment can be high. Wounds tend to heal poorly in this area and problems of wound infection, delayed wound healing, adherence of tendon to scar, calf vein thrombosis and embolism, re-rupture of the repaired tendon, and damage to the sural nerve have been reported. In a review of 25 papers reporting a total of 2647 ruptures treated surgically, Nistor found the following incidence of major complications – deep infections 1%, fistulae 3%, necrosis of skin or tendon 2%, re-rupture 2%, and an unquantified percentage of minor complications. A recent meta-analysis of all relevant publications from 1959 to 1997 found the incidence of minor and moderate complications to be 20 times higher in surgically treated patients than in those treated nonoperatively. The re-rupture rate, however, was only 2.8% for the surgically treated group compared with 11.7% in the conservatively treated group. The blood supply is usually preserved by open-invasive surgery, and it also enhances the tendon healing at the repair site. Contractures are prevented by early rehabilitation which helps the patient to recover faster. 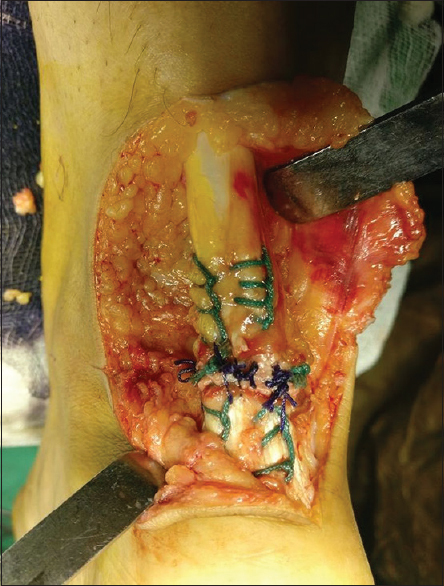 This report confirms that the combined use of open-invasive repair of the Achilles tendon and early rehabilitation techniques is a good method with excellent outcomes and fewer complications. The authors certify that they have obtained all appropriate patient consent forms. In the form, the patient has given her consent for her images and other clinical information to be reported in the journal. The patient understands that name and initial will not be published and due efforts will be made to conceal identity, but anonymity cannot be guaranteed. Wertz J, Galli M, Borchers JR. Achilles tendon rupture: Risk assessment for aerial and ground athletes. Sports Health 2013;5:407-9. Harringe ML, Renström P, Werner S. Injury incidence, mechanism and diagnosis in top-level teamgym: A prospective study conducted over one season. Scand J Med Sci Sports 2007;17:115-9. Flint JH, Wade AM, Giuliani J, Rue JP. Defining the terms acute and chronic in orthopaedic sports injuries: A systematic review. Am J Sports Med 2014;42:235-41. Assal M, Jung M, Stern R, Rippstein P, Delmi M, Hoffmeyer P, et al. Limited open repair of Achilles tendon ruptures: A technique with a new instrument and findings of a prospective multicenter study. J Bone Joint Surg Am 2002;84-A: 161-70. Schepsis AA, Jones H, Haas AL. Achilles tendon disorders in athletes. Am J Sports Med 2002;30:287-305. Yinger K, Mandelbaum BR, Almekinders LC. Achilles rupture in the athlete. Current science and treatment. Clin Podiatr Med Surg 2002;19:231-50, v.
Maffulli N. Rupture of the Achilles tendon. J Bone Joint Surg Am 1999;81:1019-36. 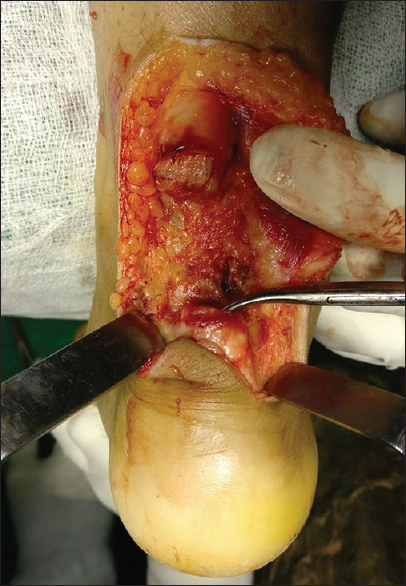 Nistor L. Surgical and non-surgical treatment of achilles tendon rupture. A prospective randomized study. J Bone Joint Surg Am 1981;63:394-9. Wong J, Barrass V, Maffulli N. Quantitative review of operative and nonoperative management of achilles tendon ruptures. Am J Sports Med 2002;30:565-75. Movin T, Ryberg A, McBride DJ, Maffulli N. Acute rupture of the achilles tendon. Foot Ankle Clin 2005;10:331-56.